I’m a little new to the pumpkin party, in the grand scheme of things. I knew nothing of pumpkin pies growing up — in my family, it was all apple, all the time. I’m not so sure I’d truly eaten a whole lot of pumpkin before I met the fella, but now, like so many of you, I’m addicted. I would not say obsessed. I don’t drink pumpkin lattes (I take mine straight, thank you very much), and I don’t even have a jar of pumpkin spice in my cabinet. But we did insist on a pumpkin cake with maple cream cheese frosting for our wedding, and when those little orange cans are on sale, hoo boy, I stock up, I make haste, and I make use. 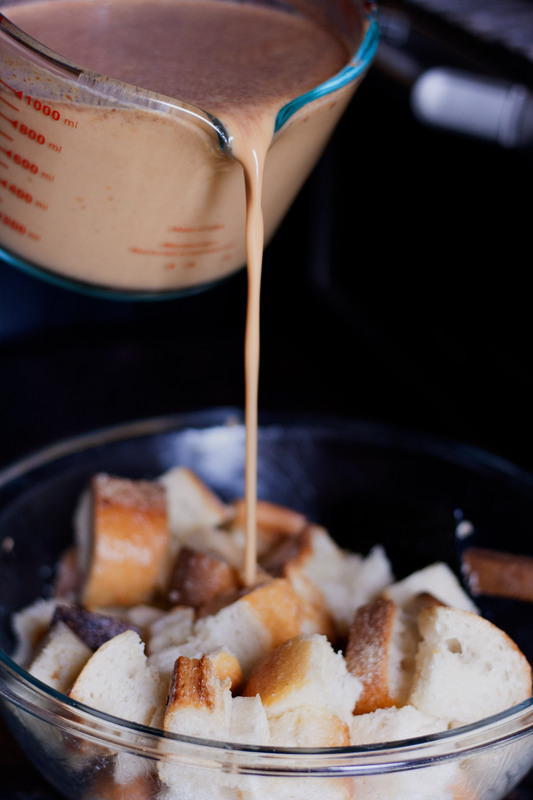 And while pumpkin pie is tops in the Thanksgiving dessert department (I love this one), sometimes you just want to rip into a baguette, drench it in a rich, decadent pumpkin custard, and call it a day. 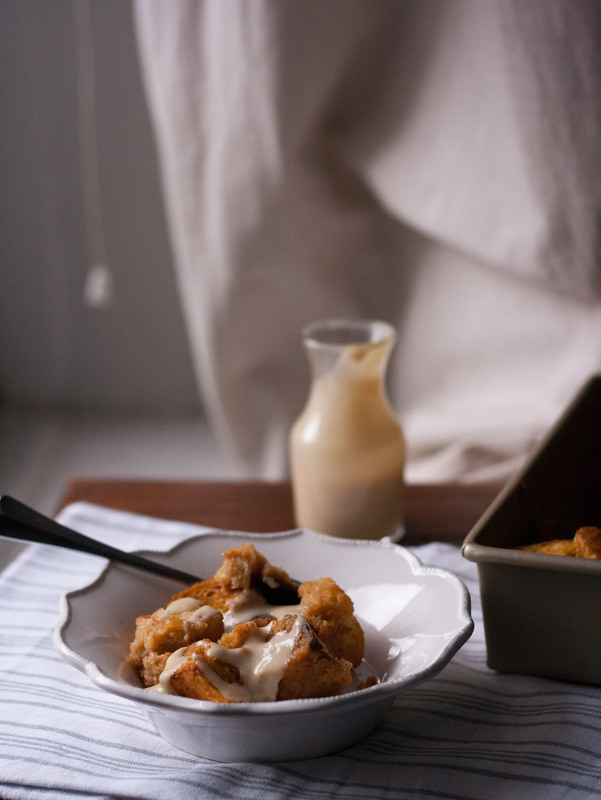 This year I’m foregoing pies and making this pumpkin bread pudding with maple cream cheese sauce, and I’m not apologizing — and once you taste it, I think you’ll agree I don’t have to. For me, it’s the combination that pulls me in: the creamy texture and the slightly sweet, earthy scent of pumpkin puree, and the hearty fall spices that give it a bit of a jump. It’s not one or the other — they need to be together here for the magic to ensue. Although pumpkin scones and pancakes are intoxicating, pumpkin puree just naturally lends itself to creamy desserts. 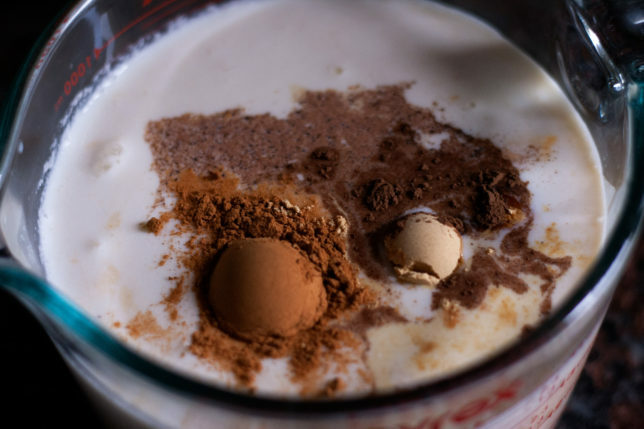 Here, it’s combined with milk, eggs, and those requisite spices. Toss in your cubed bread, smothered in melted butter, and you’ve got yourself a party. 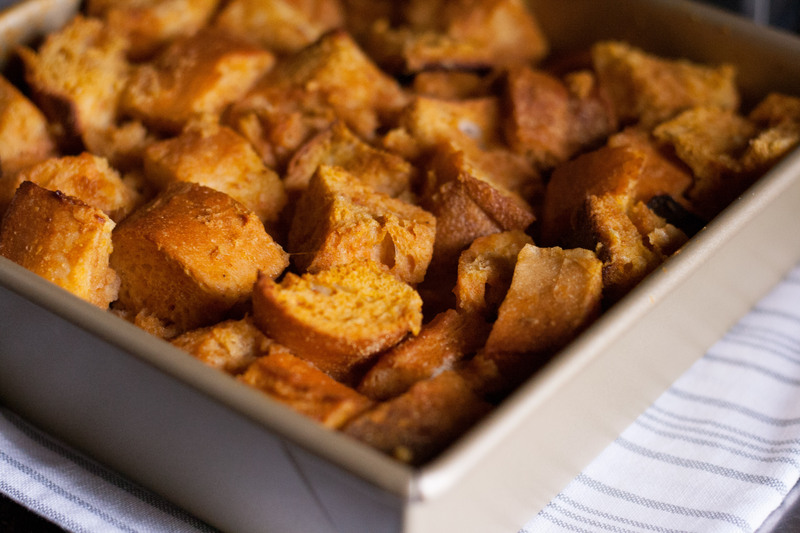 The bread pudding is baked for just 25 to 30 minutes, meaning you can assemble it in the morning, before your guests arrive, and stick it in the oven just before you sit down to your turkey and you’ll have your premier dessert piping hot and ready before you fall asleep thanks to the tryptophan. It also reheats beautifully, so you can make it a day or two in advance, too, and just re-warm it before serving. It’s a rustic stunner on its own, but we can’t leave well enough alone, can we? 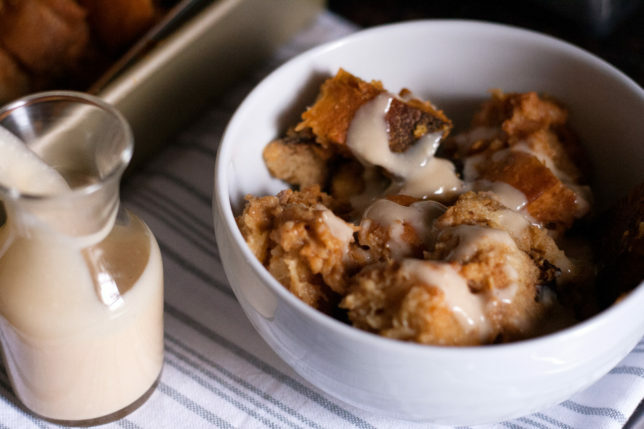 A drizzle of smooth maple cream cheese sauce gives this pumpkin bread pudding a bit of a sweet tang, and, if you’re daring, an extra kick from a bit of bourbon. And who are we kidding? This is a dessert that doubles as breakfast. We enjoyed this one with coffee and a side of crispy bacon for Sunday brunch. 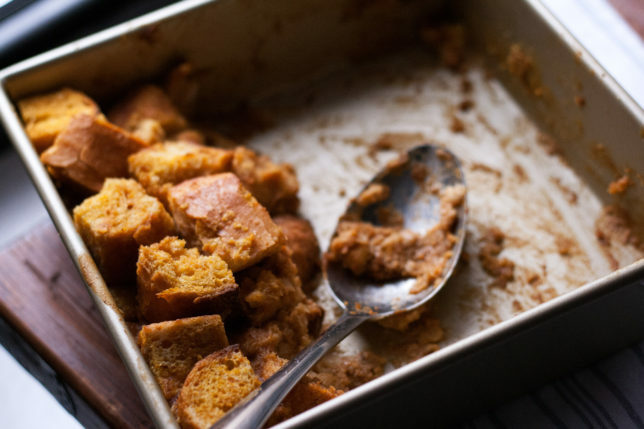 Pumpkin bread pudding, pumpkin French toast — who cares? It’s amazing any way you scoop it. That’s the kind of dish that just makes me feel all warm and fuzzy inside, kinda like pumpkin spice. Happy Thanksgiving, all. I’m thankful for you, and I’m thankful for good food. Let’s eat. This dish serves 4-6 easily, but if you’re feeding a crowd, double the recipe and bake it in a 9×13-inch baking dish. You won’t be sorry to have leftovers. Deb from Smitten Kitchen recommends melting the butter right in the dish in the oven and tossing the cubes directly in the pan, but I seem to make a mess every time I do that, so I prefer just to do it in a giant bowl, as per the original instructions. 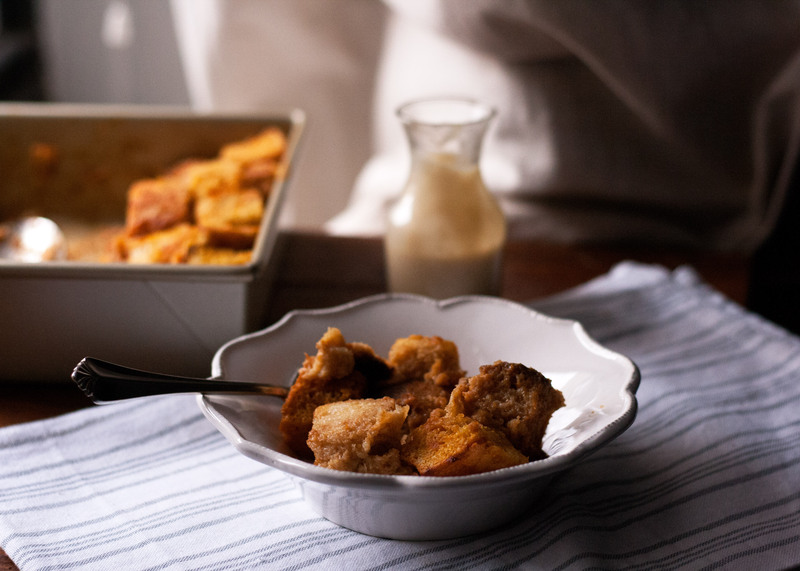 You can prepare the bread pudding up to 12 hours in advance, refrigerate the dish, and bake it when you’re ready to eat. It’s a pudding, so store it (and the sauce) in the fridge! Preheat oven to 350 degrees with a rack in the middle. 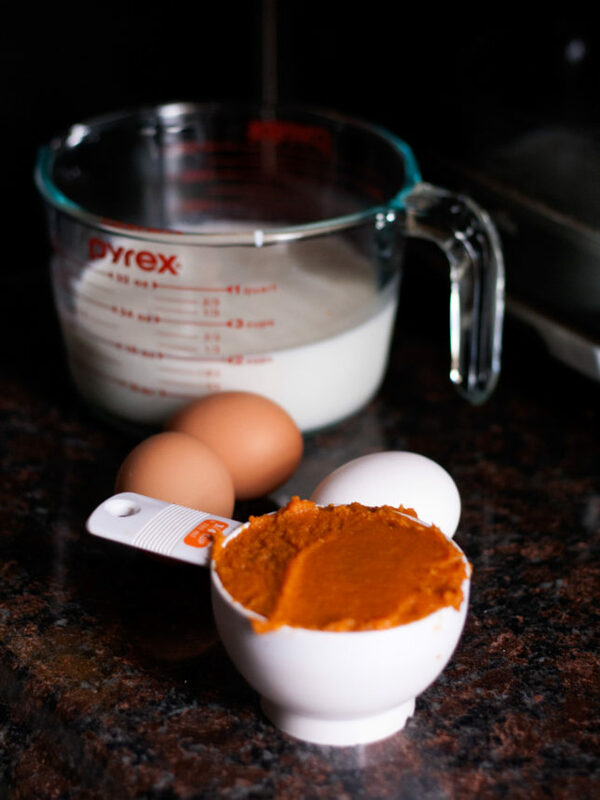 In a medium bowl, whisk together the pumpkin, milk, granulated sugar, brown sugar, eggs, yolk, salt, and spices. 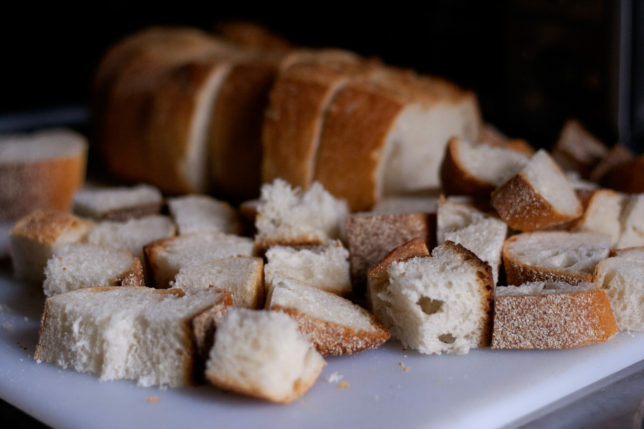 In a large bowl, toss bread cubes with the butter until fully coated. Add pumpkin mixture and toss to coat. Transfer to an ungreased 8-inch square baking dish and bake until custard is set, 25 to 30 minutes. Make the sauce by combining all ingredients and whisking, or beating with a hand mixer, until fully incorporated. 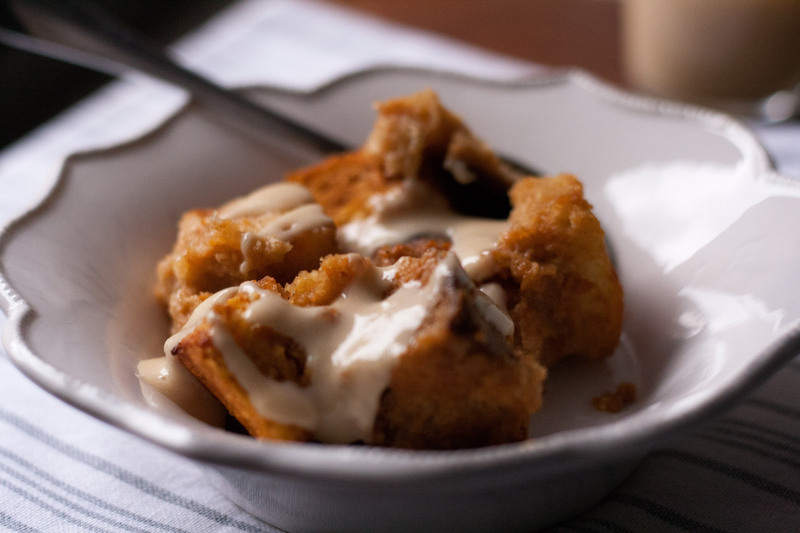 Serve bread pudding warm, passing the sauce.